Book now the best shore excursions in Meteora. High quality and safety at the lowest prices. If your are looking for Shore Excursion Meteora, book now the best guided tours at lowest price with Ancora Tours. Since 2003 we offer you official guides in english, transportation and travel insurance, all included. The highest quality at the lowest rates. These monasteries are truly one of the most spectacular sights in the world, as you’ll find out in our shore excursion in Meteora. Perched on top of steep sandstone pillars, these extraordinary places of worship have also inspired various film, TV and popular culture. You may have seen this location in the James Bond movie For Your Eyes Only. Price: 45€ | Duration: 9 hours from Volos | Level Activity: High. There are about 180 stairs to climb and unfortunately there is no access for wheelchairs. What’s eating: Juicy Greek meatballs known as Keftedakia. Souvenir: Jewellery with the classic Greek Key, or Meander pattern. Symbolising eternal life, love and friendship. Dress Code: Carefully follow the recommended dress code when visiting sacred places: do not wear shorts or skirts, shoulders covered. Women must also cover their hair, and cover trousers with a skirt. Veils and skirts are often supplied by monasteries. Comfortable walking shoes and sunscreen are recommended. Our shore excursion travels by bus for an hour and a half just to visit the Monasteries of Meteora. The greek word meteora means ‘suspended in the air’. In fact, the monasteries are built on rock formations which rise steeply, up to 300 metres high. From here, there are spectacular views of the valley below. In the 11th century hermit monks moved to these monolithic sandstone pillars to live a life of solitude and refuge. By the 16th century there were 24 monasteries in this tranquil and beautiful corner of the world. Today six remain. Meteora is the second largest Eastern Orthodox monastery in the world after Mount Athos: Amazing when you think about how difficult it must have been to build these wonders! Inside, it’s not possible to film or take photos. To reach the monasteries there are around 180 steps to climb and unfortunately there is no wheelchair access. 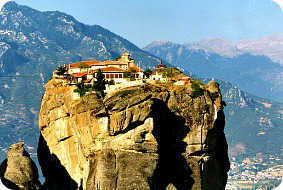 Join us on a Meteora shore excursion and visit this incredibly special and breath-taking destination.